As the years continue to tick further away from Y2K and onward toward the future, one thing that has become increasingly clear is that our technology development is on the most torrid pace ever. Two of the fastest developing sectors are the mobile and gaming worlds and everything that supports them. The conversion of these two worlds happens most often when looking at audio, because mobile gaming has probably caught (and possibly surpassed) traditional console gaming, so having a device that can support both is almost a must have. 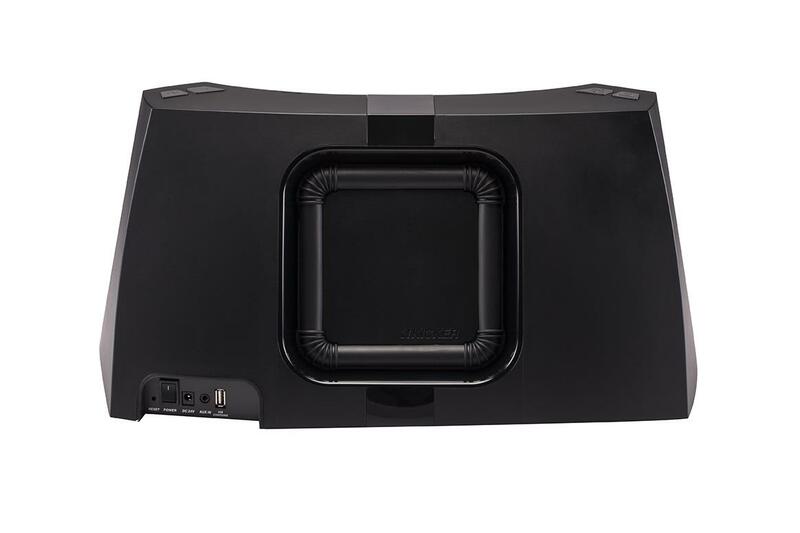 Enter Kicker’s Amphitheater BT2 Audio System. Although the BT2 is competing in a fairly bloated market, I was hoping it would provide a way to differentiate itself form the rest of the wireless speaker systems available. After spending a lot of time with it, I can most decidedly say that Kicker has a real jewel on its hands. Sometimes when you open an electronic device, you find more in the box than you would have thought necessary to pack a product for shipping. Not so with the BT2, as it was packed very carefully in both a rigid cardboard protective frame and sot-side bag. In addition, there was special attention paid to the high-gloss surfaces and buttons on the chassis of the BT2 in the form of protective shrink wrap. 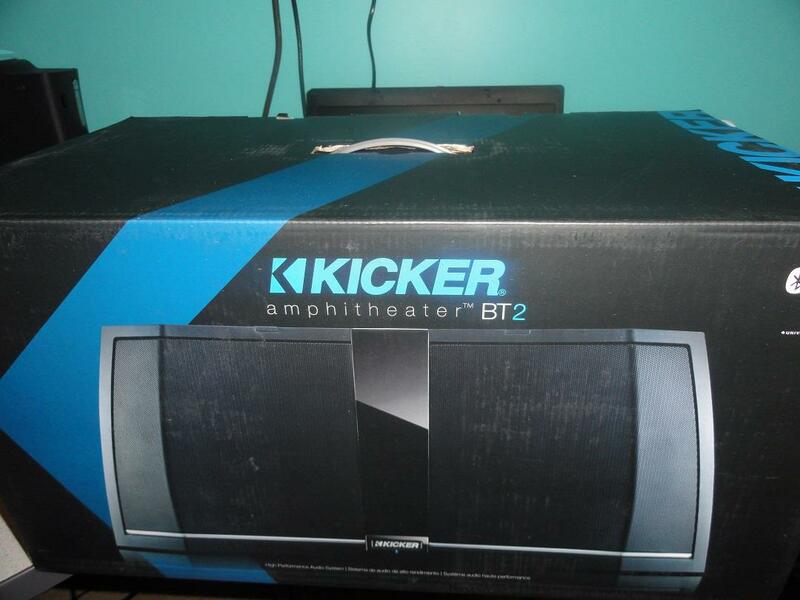 Also included with the Kicker Amphitheater BT2 box were the remote, power cord and manual. When you first take the Kicker Amphitheater out of the box and look at it from the front, it kind of looks like an oversized headrest with its curved and tapered design. However, after seeing the black with silver accent color scheme while listening to how much power comes out of this little box, this is one headrest that I would love to have on any gaming or home theater chair. The back of the Amphitheater BT2 is dominated by the 6” Square Reflex Subwoofer and also has the input panel. The sub is impressive to look at (and even more impressive to hear) and fits in with the Kicker “look.” The input panel features a reset button, power switch, DC 24v plug input, mini-jack AUX in and a USB port for device charging. What I like the most about the look of the BT2 is that it has a small footprint and the design matches just about any application you can think for its use. Whether it is a formal room, rec room, office or bedroom, the Amphitheater BT2 will fit in with the décor and not take up a lot of real estate while doing it. The remote that Kicker provides with the Amphitheater is very simple, with an ergonomic and compact design. Besides fitting really well into your hand, every button that is located on the BT2 chassis is also on the remote, so you have full control over the unit whether you are standing next to it or 30 feet away in a chair. I don’t have any real complaints about it, because it fits nice in your hand and gives you literally everything at your fingertips. 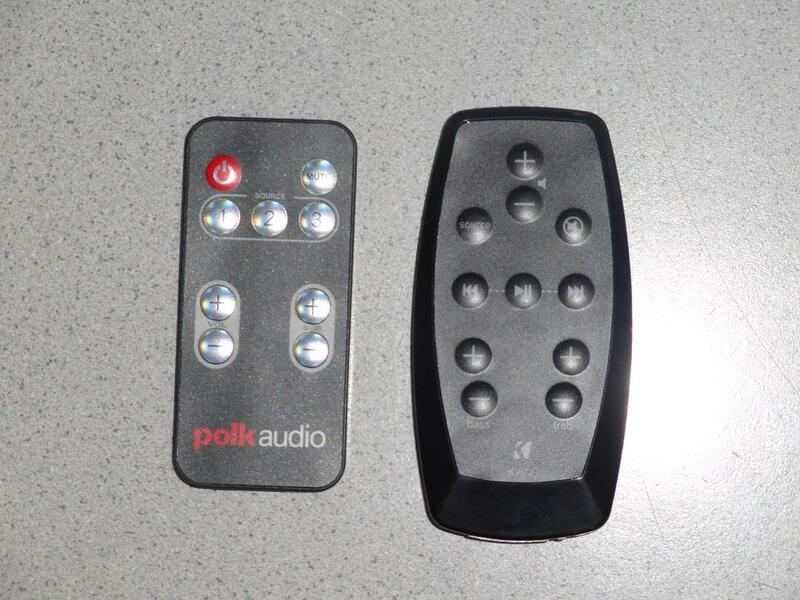 The only design element that was a bit outside the “norm” was the placement of the master volume toggle button. 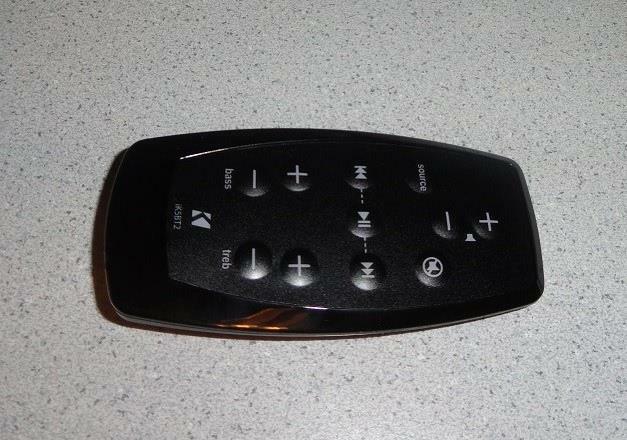 On the Kicker BT2 remote, it is located at the very top of the remote in the center, when virtually every other micro-remote I have used has the volume on the left side near the bottom. In the image at the bottom, I put it next to the Polk Audio SurroundBar 6000 credit-card remote, which you can see has the volume in the location I am used to too. 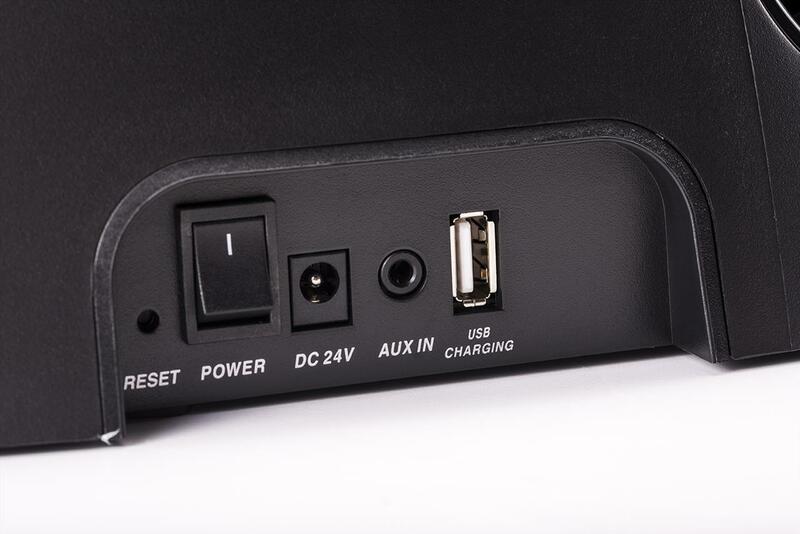 If Bluetooth isn’t available in your device, or you decide to hook up something outside the box (like a game console or TV audio out), the Amphitheater BT2 does have a mini-jack auxiliary connection. This requires stereo audio out cable on one end with a mini-jack male connector on the other to plug into the BT2. Although you physically have to connect it (as opposed to the Bluetooth wireless), this is just as easy and quick to set up any device that outputs audio. So regardless of your chosen source, the Kicker Amphitheater BT2 will most certainly play that audio to your customer specifications. After spending quite a bit of time with the Amphitheater BT2, I found that the companion KickStart app was most impressive and a great way to experience the new trend of 2nd Screen with your mobile devices. I personally like having full control over my audio, and with the 8-Band equalizer and spacialization slider bar, as well as ability to set Bluetooth pairing priorities, the KickStart app is a great companion for the 2nd screen. One hidden gem of the app is the forward thinking that allows you to apply firmware updates directly (via Buetooth) to the Amphitheater BT2 without having to go through the hassle of downloading the firmware and then uploading it to the system by using a USB port. Although the Amphitheater BT2 is a compact audio system, it has been designed to be a companion to today’s wireless world by using Bluetooth to deliver crystal clear audio to the Kicker components housed in the Amphitheater BT2 chassis. So when it is called upon to specifically provide music playback, the tweeters, mid-range drivers and that 6” sub all work in harmony to provide a generous range across the audible frequency. Because of this, the one thing that I really loved about the Amphitheater is that the audio is completely customizable to your ear and listening taste. You have several options to tweak the audio starting with the EQ or audio out settings on your device (in this case, an iPhone 5s and iPad.) Then, within the KickStart app itself there are four factory presets, four user defined presets as well as a separate Bass and Treble slider for those old school guys. 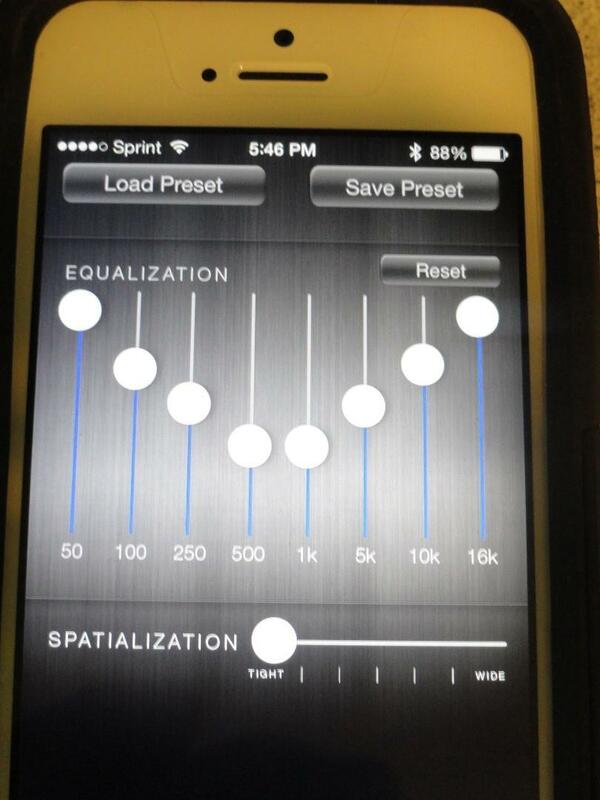 However, the best audio controls in the App are the combination of 8-band equalizer along with the Spatialization slide bar. So no matter how you prefer your audio, the Kicker Amphitheater will allow you to find your sweet spot and save it within the KickStart App. I could easily list off the 30-40 songs that I played through the BT2 during the review process, but that might be boring and, quite frankly, monotonous. The reason being that regardless of what type of song I put in there, country, rock, folk, rap or even instrumental, the Kicker Amphitheater BT2 delivered an amazing audio experience back to me. To put it mildly, I was blown away with the quality of the sound and the audio range the BT2 was capable of. After spending the better part of 11 years in retail, selling Home Theater, and most recently, portable electronics including headphones and audio systems like the BT2, I can honestly say that this is the single best sounding system I have heard at the sub $300 price point to date. However, I do have to list a few of the songs that I did some reference testing with. When I do my music testing, I always break out my list of test songs that will always start with Queensryche’s ‘Real World’. As usual, this is one of my reference songs due to its inclusion of music across the full audio range and the orchestra backing up the band. The BT2 carried the bass effortlessly without any muddying, including the part at the 3:05 mark where the music comes crashing down into the thundering of bass drums. For other review indicators, I was feeling a little nostalgic, so I went back into the 60’s and early 80’s to pull out a couple of songs to see if I could hear some of that “hidden” audio found in so many of those recordings of that era. My two choices were Jefferson Airplane’s re-mastered hit ‘White Rabbit’ and Crosby, Stills and Nash’s powerhouse ‘Southern Cross’. After listening through both songs a few times at different volume levels, I was able to pick on those audio elements (specific instruments and notes from the background) I was listening for that tend to get lost in inferior audio devices. My last reveiw test was to get a feel for how the BT2 could handle clear vocals overlayed with heavy bass tracks. My choices were Beyonce’s ‘Irreplaceable’ and Jay-Z’s ‘Empire State of Mind’, and not surprising, both songs were clear, concise and the bass was exceptional. After playing through so many different genres of songs on the Kicker Amphitheater BT2, I am convinced this is one of the best audio systems you can buy on the market today, especially at this price point. The greatest asset about the BT2 is that it is able to deliver the music to the listener no matter how fickle their tastes are due to the flexibility the hardware and KickStart app provide. Usually when testing audio devices with my gaming consoles, I hook them up with the best available physical connection (fiber optic) and start playing to kick off the review. However, with the Kicker Amphitheater BT2, the first thing I tried to do was pair it with my PlayStation 3 via Bluetooth to see if that would work. Although I thought there was a chance of a successful pairing because I seemed to have everything I needed, it was not to be. Unfortunately, despite using the recommended default passcode found in the manual, the PlayStation 3 would simply error out during each attempt. Sadly, neither the Xbox One nor the PlayStation 4 has Bluetooth pairing available at this time, which seems like a step backward to me with so many Bluetooth audio products available. Although I couldn’t hook up wirelessly, I was able to hook up my Xbox 360 via stereo cables and a mini-jack plug into the AUX in on the Amphitheater BT2. So even though this did not give me digital sound, the stereo quality that came from my games was big, bold and beautiful. Much more robust than any TV speakers or smaller audio devices could deliver. The key of course is that the Kicker system has all three aspects of the audio range available with its tweeter, mid-range drivers and bass unit, so it delivers a full range of audio that many comparably-sized systems lare unable to do. Basically, I went through several games, including Skyrim, Rock Band 3 and Call of Duty in order to get a feel for how the Amphitheater BT2 could handle the different types of soundtracks. 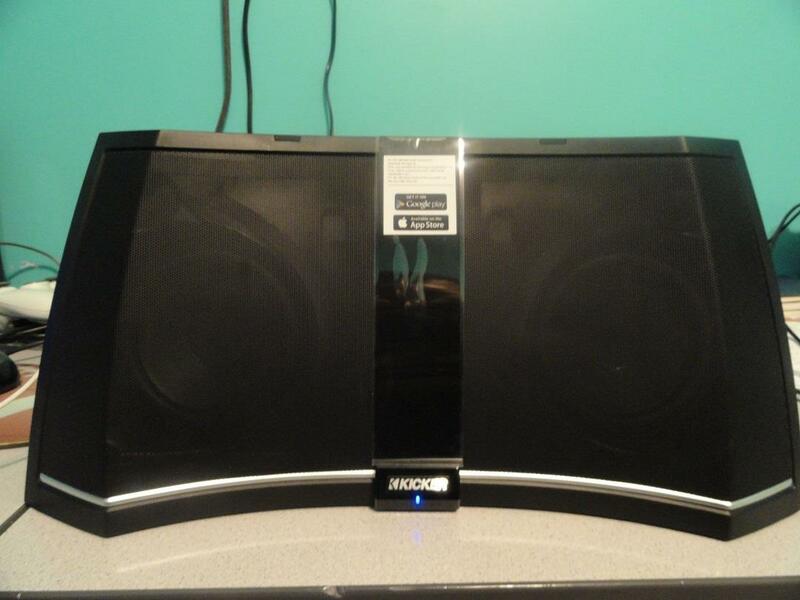 As I expected, it provided superior playback with Rock Band, even with my vocals over the top. It also handled big explosions and firefights within Call of Duty flawlessly and any battles scenes in Skyrim, especially with the dragons, filled the room with very clear audio and bass. I did find I needed to adjust the specialization slider a bit though for Call of Duty and Skyrim in order to make the audio feel less directed and more enveloping for the room. Otherwise, it was substantially better than any TV speakers and rivaled several of the same price range speaker bars that we have seen over the years. After spending several hours of game play hooked up to the Amphitheater BT2, I was pleasantly surprised at how well it handled the games audio and soundtracks. Although I did have to tweak it a bit as opposed to my music audio settings to get it to a comfortable level, the KickStart App and its four user preset slots allowed me to make a setting for gaming, music and video audio playback. Although the BT2 may not be your first option when it comes to getting a system to beef up your audio for gaming, its flexibility, compact design and exceptional audio range should have it in your list to check out. 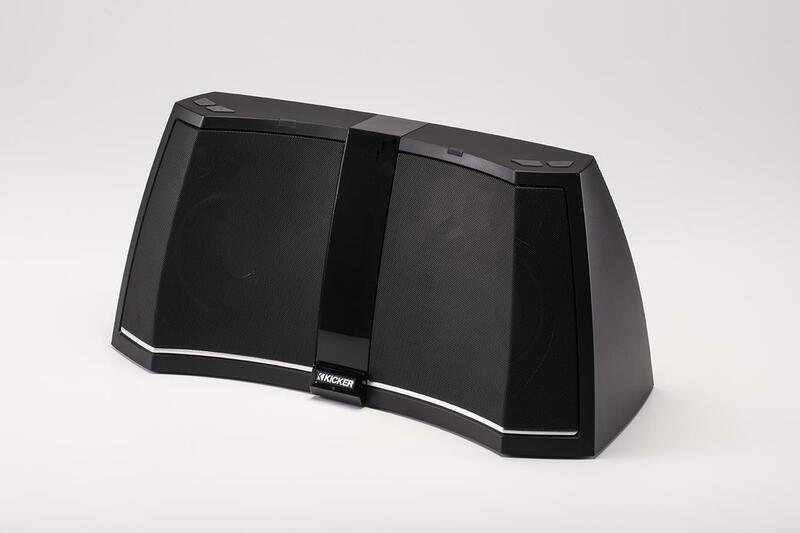 The Kicker Amphitheater is a powerfully built audio system that works well with today’s mobile devices and just about anything else you can hook into it. The sound quality is top notch, and the vast flexibility to adjust the audio output to match your own tastes is one of the things that set it apart from the competition. With an MSRP of $299, you would hope to have some HD radio capabilities available built-in, but the effort spent to build an audio device that delivers such rich sound across the entire audio frequency more than makes up for the lack of a terrestrial tuner. If you are looking for a device that looks elegant, yet can output audio like a beast, the Kicker Amphitheater BT2 is a recommended buy. The Kicker Amphitheater BT2 is a powerhouse of a system that delivers such quality audio that it wouldn’t be out of place rocking a pool party, being the centerpiece of a game room or sitting on the credenza of a Fortune 500 executive. Regardless of how you plan to use it, this is a recommended purchase if you want to get the most bang-for-your-buck in a wireless audio system.